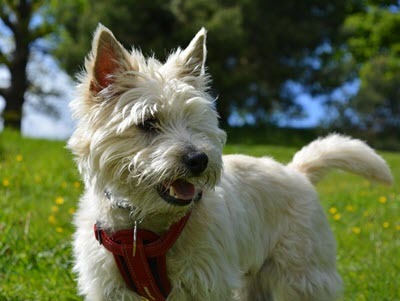 The Cairn Terrier is one of the oldest terriers and also one of Scotland’s earliest working dogs. Just like most other terriers, it is clever and strong willed and loves to dig after prey. If it fails to locate any prey, it can start pretending that prey is present and engage in vigorous digging anyway. In this article, you will find a lot of fascinating Cairn Terrier dog information. Did you for instance know why this do is known as Cairn Terrier? In Scotland, this breed was traditionally used to hunt burrowing prey among the Scottish cairns. A cairn is a man-made pile of stone, often in a conical form. In ancient times (from the Bronze Age and forward) cairns were created as funereal monuments or to highlight important landmarks, and some of them were used by astronomers. Just like most other terriers, this breed is extremely lively and needs plenty of physical and metal exercise to stay happy and healthy. 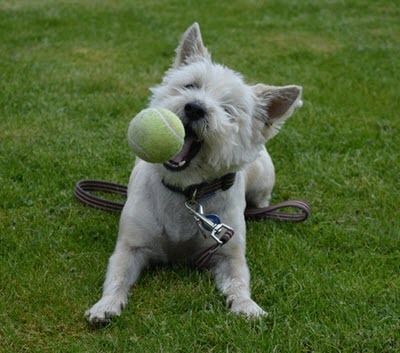 Providing your dog with sufficient amounts of challenges is an essential part of proper Cairn Terrier dog care. Coat maintenance is another important part of Cairn Terrier dog care, because without regular brushing the wiry coat of this breed turns into a mess of mats and tangles. Having your dog clipped and trimmed every few months is also recommended. The Cairn Terrier coat might look “shaggy and natural”, but it actually required quite a lot of attention. Nails must also be clipped on a regular basis. One advantage with this coat is that it sheds very little and you can remove most of the dead hairs by regular brushing. The Cairn Terrier dog puppy is truly a charming little fellow, but before you decide to get one you should ask if you will be willing and able to care for this dog and provide it with sufficient amounts of exercise for the next 15 years or more. You should also ask yourself if this is the ideal breed for your. Getting a Cairn Terrier dog puppy is an excellent choice if you are an active person that spends a lot of time outdoor and wish to devote a lot of time to the training of your dog. The Cairn Terrier does not shed a lot, and compared to most other terriers it is friendlier towards other pets. Getting a Cairn Terrier dog puppy is not a good idea if you do not wish to spend a lot of time on coat maintenance, if you can’t handle and train aggressive, strong-willed dogs, or if you dislike digging dogs with strong hunting instincts. The key to successful Cairn Terrier dog training is to be even more stubborn than this strong willed little fellow. When provided with proper amounts of exercise, training and attention, the Cairn Terrier is spirited, alert, happy and very affectionate. Females are normally even more independent than males. Once your Cairn Terrier understands that you are in charge, it will succeed in obedience training and can be thought to perform a wide range of tricks and tasks. Cairn Terrier dog training should be firm and consistent, never harsh or cruel. According to the American Kennel Club standard, the aim of Cairn Terrier dog breeding should be to develop active and hardy short-legged terriers that are very free in their movements. The ideal Cairn Terrier is strongly but never heavily built and is equipped with a hard coat capable of protecting it against the elements. Cairn Terrier dog breeding should develop dogs where the head is shorter and wider than seen in any other terrier breed. Cairn Terriers are generally healthy, but several serious health problems are associated with the breed and buying from knowledgeable and devoted Cairn Terrier dog breeder that knows how to minimize the risk for hereditary disease is important. Examples of hereditary health problems present in the breed are hip dysplasia, von Willebrand disease, progressive retinal atrophy, hypothyroidism, entropion and luxating patella. Serious Cairn Terrier dog breeders will always have their dogs screened for hereditary disease before using them from breeding. The Cairn Terrier dog price varies a lot from breeder to breeder, and investigating what you actually get for your money is very important. A healthy Cairn Terrier can live for over 15 years, and trying to save a few bucks by going for the lowest possible Cairn Terrier dog price without investigating why it is low can turn out to be an expensive decision in the long run. It is for instance important to find out if the breeder has paid to have the puppies vet-checked, vaccinated and de-wormed prior to delivery.